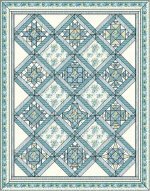 Have a Deb Tucker Studio 180 pattern that you started and not sure how to finish? Have a Deb Tucker Studio 180 tool that you’ve had and not sure how to use? Come and get some help and enjoy a time of sewing! 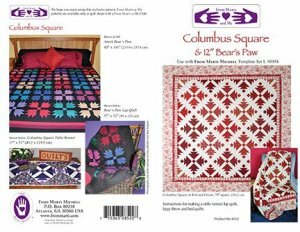 This has quickly become one of my favorite projects from Marti! It looks difficult but is really quick and easy! Friday Sew In Group Christmas Party, Friday December 21st from 10-5. Bring a covered dish to share! Don't forget, we have gift cards available for purchase! Let them know you want a Hoppin Bobbin Gift Card for Christmas! Special thanks to this group of ladies from our Friday sew in's that assisted with many of the Quilts to be made for the Faithful Fidgeting Friends Quilting Group from First Baptist Church in Elkton. 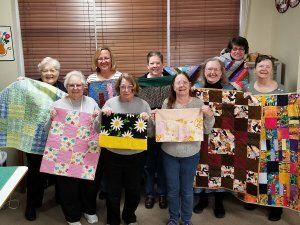 This group is making lap quilts for wheelchair bound residents and walker bags for residents, using a walker, at the Laurelwood Nursing Home in Elkton Md. Please note: Hoppin Bobbin will be closed for the Christmas Holiday from December 23rd-26th. We will also be closed on New Years Day.